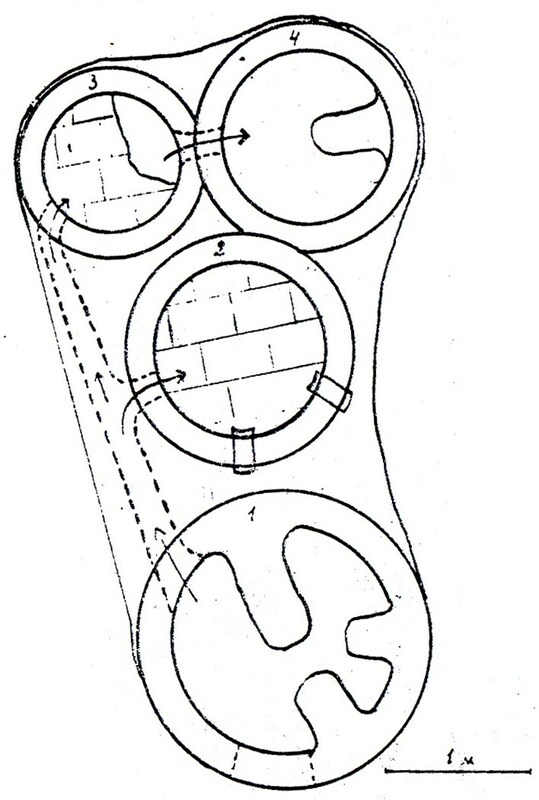 The construction comprised four two-chambered structures (two with perforated and two with solid intermediate floors) connected by a long praefurnium (image – Aleksandrov 1983, p. 60). The fire was ignited into the lower chamber of the largest structure from where the hot air was transfered to the other three parts of this facility (Aleksandrov 1983, 60-61).Unlike the “kiln-plants” in Holt and Holdeurn (see Grimes 1930, 29-37; Peacock 1982, 139-141), the kilns of this construction were unable to operate separately, because of the common praefurnium. Until now I was unable to find structure similar to that from the European part of the Roman Empire. Some comparable facilities were excavated in the Nene Valley (Woods 1974, 262-281), but they consisted of only two connected parts and had simpler construction. There is no information about the type of ceramic artefacts, fired in this facility. In my opinion it could have served for the production of both kitchenware and fine tableware (probably glazed). I would be very grateful if someone could help me with this matter. 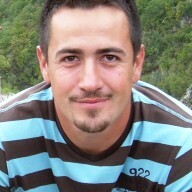 Aleksandrov 1983: G. Aleksandrov. Antichna vila #1 krai Mihailovgrad. – Izvestia na muzeite v Severozapadna Bulgaria (IMSZB), 8, 1983, 39-79. Grimes 1930: W. F. Grimes. Holt, Denbighshire. The Works-Depot of the Twentieth Legion at Castle Lyons. – Y Cymmrodor, XLI, 1930. Peacock 1982: D. P. S. Peacock. Pottery in the Roman World: an ethnoarchaeological approach. Longman, London, 1982. Woods 1974: P. J. Woods. Types of Late Belgic and Early Romano-British Pottery Kilns in the Nene Valley. – Britannia, Vol. 5, 1974, 262-281. Dear Alexander, first of all many thanks for your interesting question. It’s really a difficult subject. I looked for parallels, especially from Nene Valley, cited by you, and naturally in the book of Vivien Swan (The pottery kilns of Roman Britain) etc. But without any result. I saw also the original publication by G. Aleksandrov. I failed to read it in Bulgarian, but I saw the picture from the excavation (p. 59). And now I have my doubts, whether it was well excavated (for ex. no trenches to be seen). And so also doubts, that all four kilns would work in the same time. And fired from inside of the lower part of kiln 4 ??? And the heath would be enough for all four kilns? When I understood it correctly, at two of them (no. 2 and 3) the floors of the firing chamber (‘laboratoire’) were saved whole or partly. So it is my impression, that these kilns were constructed at a lower level. And had perhaps (?) a common praefurnium outside. And the two larger kilns (1 and 4) could have a common praefunium between them. (Could also be, on this place was as first the praefurnium of kiln 2 and this praefurnium was later reused for the larger kilns.) When the photo showes really the latest situation of the excavation, that space was free only in a smaller part. And also the whole area around the kilns, especially outside of the large kiln 1, was not excavated. So we have any information, what was outside around the kilns. It could only be clearer, if one would have the chance to re-excavate it. And the results perhaps would let appear this mystery in a different light. (Cf. the “grand four” of La Graufesenque: Alain Vernhet –> Daniel Schaad). Unfortunately the site where this construction was excavated is now submerged under the surface of a dam so no future research could be conducted there and we have to rely only on the published information. I am also not certain whether the construction was well and fully excavated so this is another issue of concern (and to add to that you may have noticed that either the drawing or the photo is a mirror image to the other). At first I also thought that the heat from the first kiln midht has been insufficient for simultaneous firing of the whole construction. Therefore I messured the lenght of the praefurnium which was between 2 and 2,40 m, while the widht was about 0,30-0,40 m. Given this size and assuming that it was fully covered (and not very tall) we can estimate that the hot air was able to circulate retaining its high temperature at least in kilns 2 and 3 . In addition, the author stated that there where openings leading from kiln 1 to the corridor and from there to kiln 2 and 3, while kiln 4 was accessible only from the combustion chamber of kiln 3 (no other side openings were mentioned). He also wrote that ash and charcoal were found on the bottom of the praefurnium and that the interior of the lower chamber of kiln 4 was rather well fired, but less than the one of kiln 1. 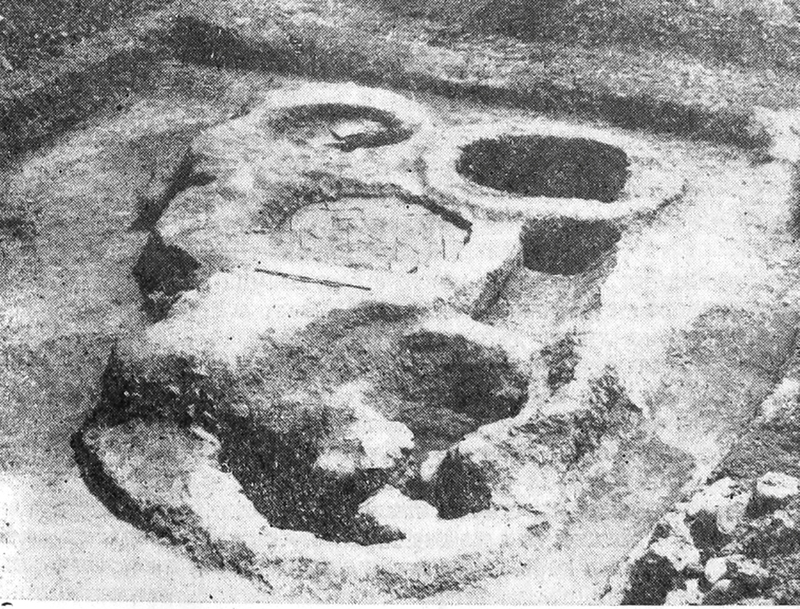 According to the information of the author and the picture, it seems that the intermediated floors of kiln 2, 3 and 4 were positioned at about the same level, while the combustion chamber of kiln 1 was dug a little deeper (this was probably done for better circulations of the hot air). Maybe because of the more solid construction, only the floors of 2 and 3 were entirely preserved (Aleksandrov wrote that the one of kiln 4 was partially preserved). Having all of this in mind I am inclined on thinking that the author was right and that every kiln (or part of this unusual kiln-plant) was built with specific purpose, suplementing that of the others. He suggested that the structures with solid floors (2 and 3) were used for drying or biscuit firing of ceramic vessels which were later glazed and fired either in kiln 1 or in kiln 4. On the contrary, for me it seems much more plausable that in kiln 1 only coarse wares with larger inclusions were fired (due to the almost direct contact with the flames), while kilns 2 and 3 were used for the firing of fine table wares (probably glazed) with indirect heating (in a way similar to the one used in some of the sigillata kilns – for example the one from Padova, published in Cipriano, Mazzocchin 2010). As for kiln 4, this was probably a place for biscuit firing or it was used for the production of domestic pottery (since less heat was needed for its manufacture). Simultaneous production of kitchen wares and glazed vessels was attested in the territory of Hungary (see Magrini, Sbarra 2010) so I think that this is possibility. I would be very interested in your opinion about my suggestions. S. Cipriano, S. Mazzocchin. Un quartiere artigianale a Patavium. La fornace per la produzione di terra sigillata tardo-padana. – RCRF Acta 41, 2010, 141-153. C. Magrini, F. Sbarra. Late Roman Glazed Pottery Production Sites in Central-East Europe: Some Remarks on Pannonia I and Valeria. – In: Late Roman Glazed Pottery in Carlino and in Central-East Europe. Production, Function and Distribution. BAR International Series 2068, 2010, 71-78.
after your helpful remark about the mirror image of one of the figures I first corrected the difference between drawing and photo: I mirrored the drawing and turned it on 180°. Then I brought it together with the photo (see below). So it will be clearer how wrong the drawing is. Two main points: 1. All suggested firing channels could only have been – if they existed – on the right, not on the left side. 2. In the drawing the kiln 1 had also to be positioned more to the right side. On the photo it seems (!? ), that in the outer wall of kiln 1 was an opening towards kiln 4. The similar position at kiln 4 is not clear, lies in the shadow, but could also not yet been reached in the level of the excavation. 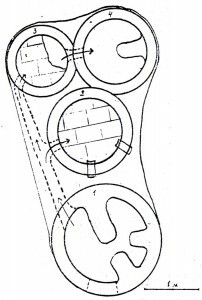 An opening in the wall of kiln 2, as shown in the drawing, could not have been observed, because the excavation level was not deep enough and the bricks on the inner part of the kiln 2 had not been uncovered. Also a firing channel between kiln 1 and the other three kilns is surely only a hypothesis of the excavator. According to this also the end of such a channel could not have been observed, because there the bricks were still in situ (cf. the photo). Connection between kiln 3 and 4? We don’t know, whether there really was seen an opening in the walls or only in one of them and in which – or it is also only a hypothesis of the excavator. (At least in the part in question at kiln 2 the floor of bricks was open). Important could be to have a look to the contact zones between kilns 2 and 4 and also between kilns 3 and 4. How you can see on the photo, the kiln 2 is cut by the kiln 4 (not 4 by 2, as showed in the drawing!). That means, the kiln 4 used with its outer wall partly the outer wall of kiln 2. Conclusion: Kiln 2 must be earlier! The same situation is, correctly in the drawing, between kilns 3 and 4. Kiln 3 was earlier than kiln 4! Phase 1: kiln 2 and 3 (smaller dimensions, the bricks of the floor inside partly in situ). Phase 2: kiln 1 and 4 (larger dimensions, the floors of the firing chambers destroyed). It’s a pity, that the whole area around the kiln was not excavated. And the method of excavation was really not up to date. So e.g. we cannot know, where the firing cellars had been in reality. (Perhaps kilns 2 and 3 on the one side and kilns 1 and 4 on the other side had their common firing cellar.) And similarly could a lot of other questions. Bearing in mind this knowledge statements about the pottery wares, produced in these kilns, seem for me absolutely impossible. At the end all our reflections about this group of kilns must remain speculative and “the rest is silence”. after going through the publication once more and having in mind your suggestions, I was able to make the following conclusions. First, I have made a mistake about the mirror image. It’s just that when the picture was taken, the praefurnium described by the author was already dug out and what we see on the right is just a trench, which was probably excavated in search of another connection between the kilns (this as well as other structures found on the site were probably dismantled due to its submergence beneath the surface of a dam and that nothing was preserved for future exposition). With the help of your observations I can now also see that there were at least two fases of kiln building. For me it seems that the kiln 1 was the first one built, but that kilns 2 and 3 were probably erected either at the same time, or later, but together. Kiln 4 seems to be last one built, given that, as you pointed out, it overlaps kiln 2. As for the side praefurnium, the author is convinced of its presence and due to his description there seems to be no doubt that it has existed. He writes that it was constructed with tiles (tegulae and imbrices) bonded with clay, and that on its bottom ash and little charcoal were found. The openings between this corridor and the kilns, as well as those between kilns 3 and 4, also must have existed (again judging by Aleksandrov’s description). Your suggestion for the ruined stated of kiln 1 in the time of operation of the other kilns seems logical, but there is a little problem with the remains of supports found inside. If it was just used as a stoke pit for the other kilns, the potters could have probably removed the three cross walls to avoid the loss of heat and for better circulation of the hot air. Also if the kiln 1 was used separately in the first face its entrance might had been placed opposite to he central of the three supports (which is the usual manner of building). So it seems that the two openings visible on the drawing were built simultaneously. If we look at kiln 4, you are right that it was the latest built, but its entrance from the lower chamber of kiln 3 seems certain (the oven floor of kiln 4 was found ruined in its lower chamber, so this opening was visible from the inside), and to add to that this opening was set up directly in front of the tongue wall (which is also the usual manner of building for these constructions, visible in almost all of the examplens known to me), and after excavating its lower chamber no other opening was found by the excavators. To summarise, now it seems that kilns 1, 2 and 3 were built around the same time together with the side praefurnium, while kiln 4 was erected later, but at a period when the other structures were still in use. Kilns 2 and 3 were obviously smaller, but there is no description of how their oven floor were built and supported. It is only certain that they also had two chambers (the two side openings of kiln 2 visible on the drawing were side vents of the upper chamber, made by imbrices and were probably set up for inserting test pieces, as the ones used in glazed ware production). It can be suggested that the lower possition of kiln 1 was also made intentionally – for better heat circulation. All of this being said, I agree that in this case, where we have to rely only on this kind of amount of information (without precise and thorough documentation and extensive description), these suggestions will hardly be proven. 1. How mentioned, the outer wall of kiln 4 uses a part of kiln 2 and not vice versa. 2. The position of kiln 2 had been more to the left side. 3. In the photo you can see, that kiln 1 has an opening of the wall towards kiln 4. The opening for a channel, as the excavator showed in the drawing, is not to be seen, because this part is not excavated, but covered by earth. On the other side, the tegulae, imbrices etc., which he described for the opening, he could have found there in the opening, which we see on the photo. That the whole region of the described channels was dismantled, I cannot believe. There (on the left side on the photo) the level seems to be not deeper than in front of kiln 1 (at our view of the photo). So I also cannot imagine, that the excavator had seen an opening between his “channel system” and the kiln, because inside of the kiln 3 this part was covered by the bricks of the floor. So my only interpretation is: The excavator made his drawing later. The position of the kilns is nearly correct (only mistakes in the overlaps at kiln 4), but he was confused about the position of his suggested channel system. It should be placed on the right side, not on the left. That fits to the position of the opening in kiln 1, to be seen on the photo. The opening between the suggested channel to kiln 2 he could not have seen: Inside it was covered by the bricks, outside the level of the earth was too high for a praefurnium entrance. For the connection between kiln 3 and 4 I have no solution, although I agree your argument, “that the opening was set up directly in front of the tongue wall”, how we know it from many other kilns. But at all there are so many ambiguities and inconsistencies between description, drawing and photo documentation and so few chances to clear it only on the base of the publication, that I would like to finish here the discussion from my part. But perhaps you will have still new ideas? I agree with your arguments about the errors in the drawing. I am just not convinced that there was an actual opening in the chamber of kiln 1 in direction to kiln 4. I tried working on the photo and it seems that at this place there was just a shadow, falling from the right side of the construction. Writing that, I am not at all certain that this was the original situation. I also agree that the drawing might have been completed later (or that it was started and finished at different point of the excavations) but I wonder whether the author could have made such a big mistake, placing the praefurnium on the wrong side. Finally, you are right that there are too many unknowns in this matter and that it cannot be solved only with the aid of the published materials. Thank you again for participating in the discussion, it was really helpful for me. thank you too for our discussion. Perhaps once upon a time you will have the possibility to see the original documentation of this excavation in the Archive and then you could perhaps be able, to bring more light into the open questions. If you will succeed in this, please let me know this and also our community at this place. We will enjoy to learn more about this interesting group of kilns.